That makes sense, Olivier, although it is true for everyone that it’s not possible to get the feel and look of a particular model without holding and playing it, which of course also gives you a sense of its key action, responsiveness and so on. If you asked which feels better and more comfortable in the hand, the answer would be clear for me, the Yamaha, and a Yamaha P-32D in particular, which balances nicely cradled in the left hand. I personally wouldn’t be without both a P-32D and a Suzuki M-32C. It really is not necessary to decide between them (or between the 37 key models, if that’s your preference.) I think it would be unfortunate to pass on these models just because there’s uncertainty from not being able to try them out. Life is short. I predict that you will find an upgrade to one of these from the Performer 37 to be a quantum leap. Thanks again for your comments, I appreciate. I was also reading that some people had problem with moisiture comming out of the P37D. This part isn’t clear for me mainly because English is my second language. Is the spit valve good on the P37D? Also, are the mouth pieces comfortable on the M37C and P37D? The mouth pieces of both are comfortable, though different. On the P-37D, the spit valve arrangement does not include a direct vent out of the melodica, so moisture vents into the outer casing, from which it drains or evaporates. But this does not create odor or result in clogging. As a matter of fact, the moisture does not have to be blown out as often as is the case with many other melodicas. I personally prefer playing the Yamahas without a mouthpiece, as Jon Batiste typically plays his melodicas. Doing so is not more comfortable, but it provides more of a feeling of intimacy with the melodica, more feeling of the vibration, a kind of sensation that you might like in the absence of the visual aesthetic. Because of the nature of the mouthpiece opening, playing without a mouthpiece is trickier on the metal tray Suzukis, though Jon does it. 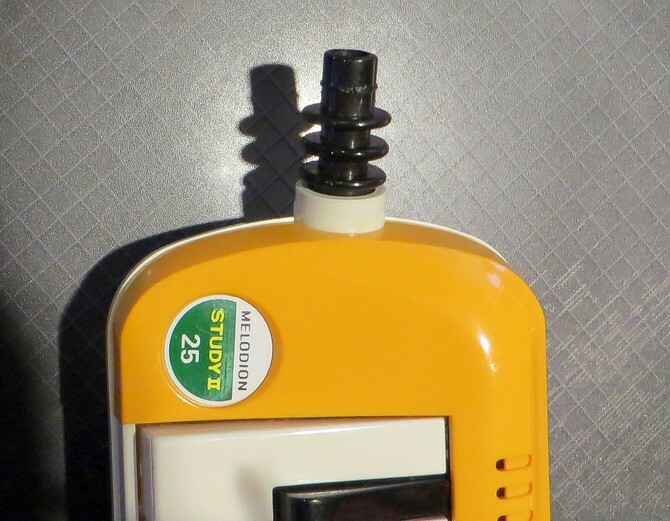 There is a space between the plastic mouthpiece receptacle and the plastic encasement of it in the melodica endpiece – I’m not describing this very well! So for them I like to use the fitting end of the long tube as a mouthpiece, or another more minimalistic alternative mouthpiece. This is, of course, a matter of personal preference. 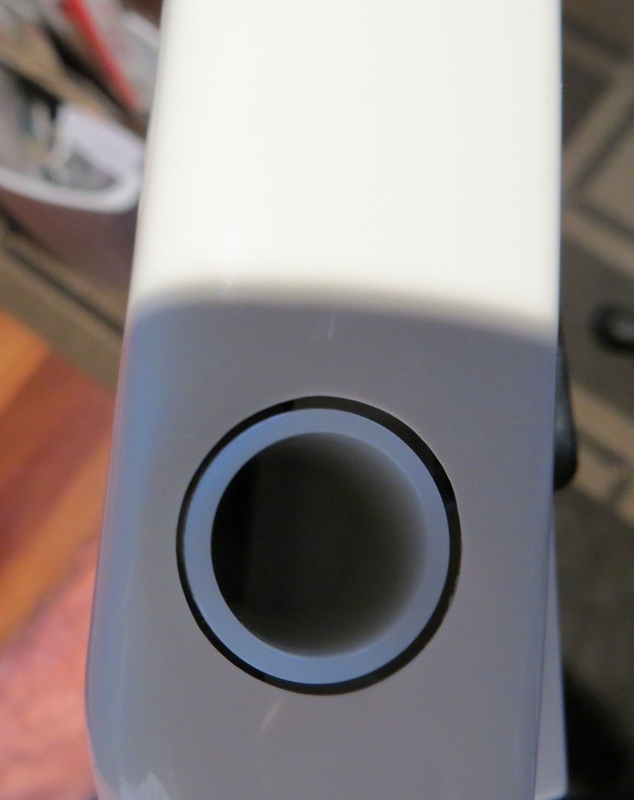 The mouthpiece of the Yamahas has a duckbill shape, so that the opening is a slot rather than a round hole. It feels good in the mouth; but, in my opinion, a round opening allows for more control, for example in bending notes. If you lived near Boise, Idaho, I could let you try out my melodicas and mouthpieces. I think we live too far away from each other unfortunately. I live in Canada. However, thanks anyway for the proposition. I can’t wait to take the Suzuki M37C in my hands. Julie C. Could you tell me which one you chose when you will make your decision? Personnally, I think I’ll go with the Suzuki for now because I will be able to touch it before deciding if I buy it or not. I might eventually take the Yamaha as well. I think whichever you get, you’ll feel that you made the right decision. And then when you add the other, you’ll be delighted with it as well! That was precisely my experience. It’s like having two different voices, each expressive in its own way. This reply was modified 1 year, 8 months ago by Martin M.
The most remarkable thing happened today, a student walked in and had bought the Yamaha P37!! He left it with me to try out as he knows I’ve boiled it down to a few models. I really liked it, a lot, the action and tone was great, chords very easy to play, nice warm tone, not too “brassy” but, the caveat is the mouthpiece. I didn’t like it, the shape doesn’t allow me to stand in the right position for me and Alan, like you, I don’t like to use a mouthpiece at all but there isn’t enough of a lip(? can’t think of word, you know what I mean) around the hole, to hang onto!! You (Alan) know what I mean. So just that alone would rule it out for me, unfortunately, because everything else about it is great (the keys are a tiny bit wider yes?, which is cool). I do feel after playing it that I don’t think I really need those top notes so realize that for now I’d be very happy with 32. Alan–there doesn’t seem to be any black Suzuki M32’s so I guess it’ll have to be blue OR just get the Suzuki M37 which is black (and has that groovy-looking case, haha, I really don’t care about the case!) but then we are back to 37 keys and possibly heavier.I think now for me it boils down to: 1. does the Suzuki have a whatever you call it I can get my mouth around! (OMG where is this going…LOL), there must be, cos I see Batiste do it! and 2. weight, the weights of the two models (gonna go look that up right now), if not significant I’d take either the M32C or the 37. Martin: My wife has sometimes asked me why I have to have two motorcycles. I’d have a garage full of them if motorcycles were as cheap as melodicas, and for the same reason. And this photo shows why the metal tray Suzuki does not lend itself so easily to playing without a mouthpiece. There is a space around the hole, so that if you cover the whole opening and blow, air escapes. On the whole, I prefer to play the Yamahas without a mouthpiece. 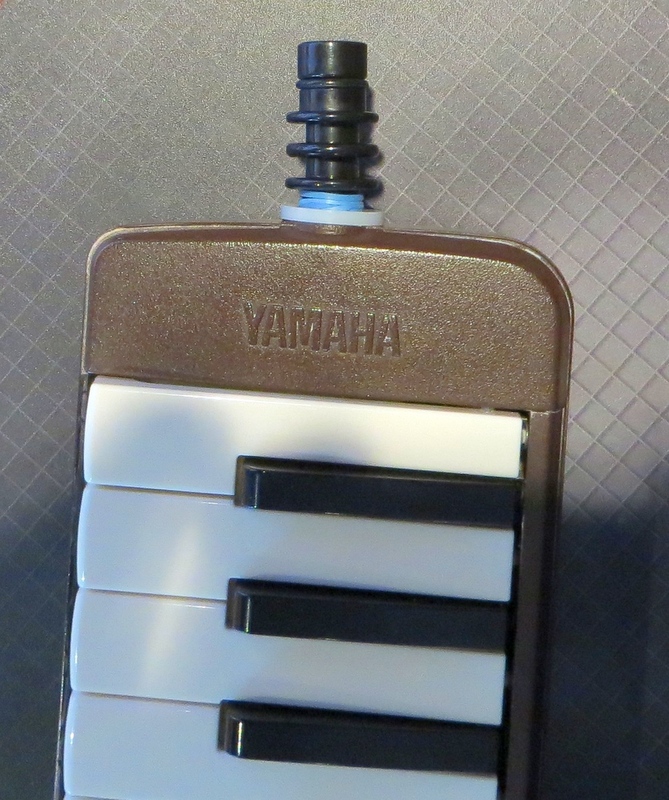 Is the Yamaha P37D mouthpiece the same that the Performer37? I have a bit of difficulty to imagine how it looks like. It is the same style of mouthpiece, what I call a duckbill mouthpiece. It is a bit more angular and not as smooth in its contours or as comfortable in the mouth. In my opinion, it is fine but inferior to the Yamaha mouthpiece. Hohner mouthpieces do not fit Yamahas. The difference in shape would be easy to tell with your fingers. Ok, thanks for the info. I also have a Suzuki 32 notes. I can’t tell you which one it is but I can tell you that the plastic cylindric mouthpiece is uncomfortable compared to my Performer37. This was my first melodica that I got. I’ll ask someone to tell me the modal to be able to tell it to you. 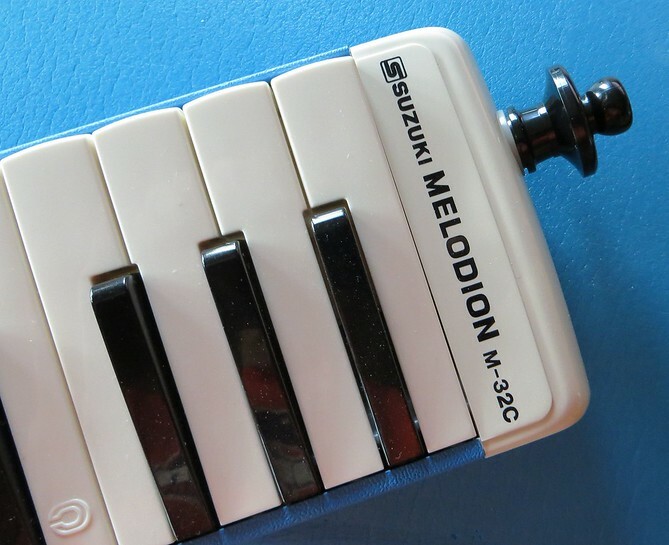 I think you are referring to the inexpensive Suzuki Study 32, actually not a bad melodica. Its mouthpiece is the same design as used with the metal tray Suzukis, long and narrow, with a ridge that feels sharp near the mouth end. I do not like this mouthpiece; it is awkward for me and too long. That’s why I usually use either the fitting from the long tube as a mouthpiece or another type of Suzuki mouthpiece, the short one I mentioned above that looks like a black pawn in a standard chess set; you put what would be the head of the pawn in your mouth. It is model MP-142, available on eBay now for $18.47 U.S, shipped for free to the U.S. (I think also to Canada). Or it can be purchased for about $7 U.S. directly from Japan, but with shipping of about $18. The shipping would probably be the same if you ordered several, though.